The Labour Party’s ‘Friends of Cyprus Group’ was launched on Tuesday evening at an event held in the UK Parliament, in the presence of the party’s leader Jeremy Corbyn and a number of Labour MPs. 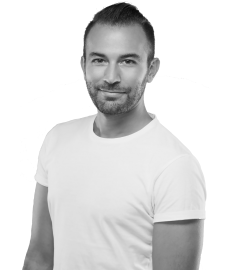 The initiative for the creation of the group belongs to Vassilis Mavrou, who said that he aim is to ”create closer bonds between Labour MPs and Cypriots, both in the UK and in Cyprus.” He noted that Jeremy Corbyn’s support was a catalyst for the launch of the group. In his address, Corbyn said that he represents a constituency that includes a huge number of Cypriots, both of Greek and of Turkish ethnical background, and that in 1974 he remembers trying to help Cypriots arriving to London as refugees following the invasion by Turkey. ”The contribution made to our communities and our lives by those people is really incredible,” commented the Labour Party leader. He went on to say that there must be a reunification of Cyprus and a resumption of the collapsed talks. ”Campaigning for Cyprus and having a sense of responsibility towards Cyprus is very important to me. I recognise that the UK is a guarantor power and I want a Labour government to ensure that we fulfil our obligations, to ensure that this means the island of Cyprus gets reunified,” he added. The first UK Cypriot MP Bambos Charalambous said that there is still hope for a solution, despite the collapse of the talks in Crans Montana. He added that during his recent visit in Cyprus, he realised that Cypriots are worried about the chances to solve the Cyprus problem as with the elections coming up in January, the timing is not ideal. The Cypriot MP also said that the Labour Party Friends of Cyprus needs to put more pressure on Boris Johnson and the Foreign Office to support Cyprus. The coordinator of the event and MP for Hornsey and Wood Green, Catherine West, said that the Labour Party will support Cyprus in its efforts to find a just and viable solution. On her behalf, the hostess of the event, MP Kate Osamor, said she is proud to be part of this newly formed group which aims to take responsibilities and to speak on behalf of the community. Joan Ryan, MP for Enfield North, said that her constituency is a fantastic example of how Turkish and Greek Cypriots work and live together. “The two communities have more in common than divides them,” she added. Other MPs that were present and spoke in support of Cyprus and the new group were Angela Rayner, Stephen Doughty, Steve McCabe, Joan Ryan, Roger Gossif, Carolyn Harris, Hugh Gaffney and Caroline Flint. Greece will have to get past Croatia if they are to earn a spot at next summer’s FIFA World Cup in Russia. Greece drew Croatia out of the pot on Tuesday 17th October at the 2018 World Cup playoff draw at FIFA headquarters in Zurich. Ethniki could become the first UEFA member nation to reach three World Cups in a row via the playoffs. Greece will travel to Croatia on November 9th for the first leg at the Maksimir Stadium in Zagreb with kick off scheduled for 9:45 PM local Greek time. The return leg will take place three days later in Athens at the Karaiskakis Stadium on Sunday, November 12th, with kick off scheduled for the same time 9:45 PM local Greek time. The annual Radiomarathon Gala Dinner will take place at Inter-Continental London Park Lane Hotel on Saturday 28th October. This glamorous evening of Dinner and Dance with star guest this year being the incredible Anna Vissi is Radiomarathon’s biggest fundraising event of the year which raises vital funds for the Enfield Centre. The event is held under the auspices of Andri Anastasiades, spouse of the President of the Republic of Cyprus and President of the Radiomarathon Foundation. Ticket prices start at £150 per person, including 3-course meal, available individually or as tables of 12. Telephone 01992 713297 and speak to Demetra or Sandra. All donations go towards running the Radiomarathon Centre which provides facilities and cares for people with learning disabilities. Your support will make a huge impact today, tomorrow, and at all times. 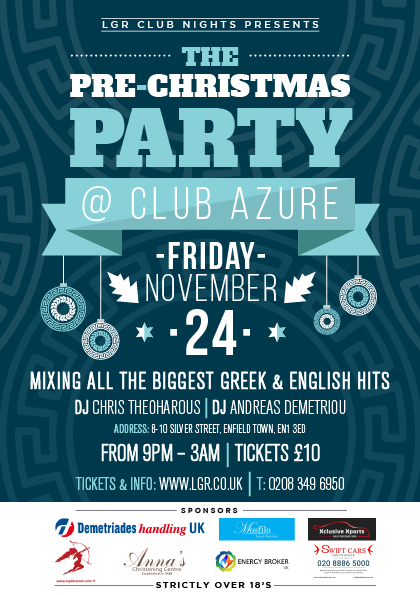 We are kicking off the start of the festive season with a pre-Christmas party at Club Azure in Enfield. Join us on Friday 24th November 2017 to welcome December with a bang! Our DJs Chris Theoharous & Andreas Demetriou will be on the Club Azure decks mixing non-stop Greek & English hits, all night long. Fusing all the best Modern Laika, Greek Club, Greek Classics and Zeimbekika with all the biggest English hits of the decade. Doors open at 9pm and we’ll keep you dancing till 3am. For table reservations call Club Azure on 07789 488470. [Strictly over 18s. NO ID, NO ENTRY, NO TRAINERS]. To buy tickets for this event please visit our events page: LGR Presents… The Pre-Christmas Party tickets from Skiddle. 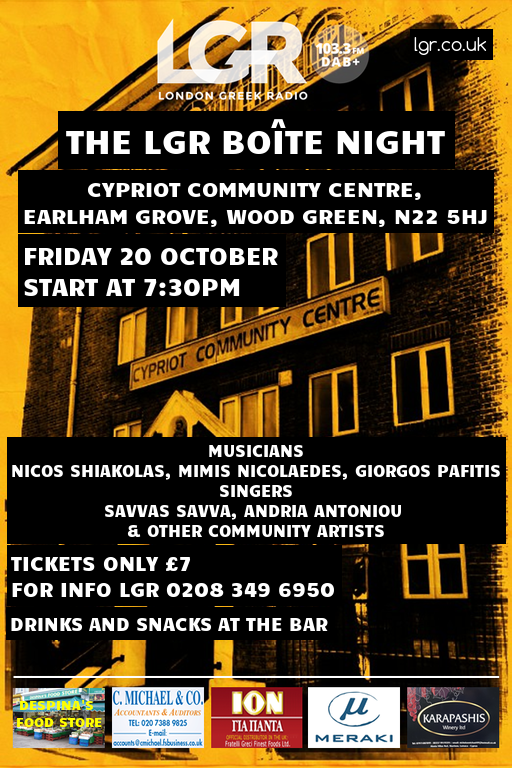 The LGR Boîte Night, on Friday 20th October, is hosting a spectacular evening with a line-up of local community artists. Enjoy a traditional Boîte styled evening in a chilled and relaxed atmosphere. Entertaining us on the night are the talented; Nicos Shiakolas, Mimis Nicolaedes, Giorgos Pafitis, Savvas Savva, Andria Antoniou & other community artists. Join us in the bar of the Cypriot Community Centre, Earlham Grove, Wood Green. Let’s have a drink and listen to the live music and have an amazing evening. You can even sing along too and really let your hair down. There will be drinks and snacks available at the bar. This will be an unforgettable night with our dearest London Greek Radio audience. Doors will open at 7:30 pm. This event is sponsored by: Despina’s Food Store, C.Michael Accountants & Bookkeepers, Fratelli Greci Finest Foods, exclusive distributors of ION chocolate products and Zagori Mineral Water in the UK, Meraki Grill and Ambeli Ltd, exclusive distributors of Karapashis Winery. Tonight in a 7:45 pm kick-off in Nicosia we will see Cyprus take on Greece in a match in Group H qualification. As things stand now, the Cypriot squad still mathematically possible for them to finish as runners-up. Despite a brilliant 3-2 win over Bosnia and Herzegovina in August, the Cypriots could not repeat the result in Estonia. A 1-0 defeat away put a serious dent into Cypriot hopes of their first World Cup appearance. The Top 8 out of 9 runner-up teams make the playoffs and for one team their qualifying hopes will simply end next week. Greece currently in third position a single point behind Bosnia and Herzegovina will need to beat Cyprus and see-off Gibraltar in the final match on Tuesday night. The Greeks knowing that only a Belgium victory against Bosnia on top of it, second place is theirs to lose, but they will still face a nervous wait to find out who will miss the cut for the playoffs. Cyprus coach Ben Shimon has had to deal with a few injury concerns in the lead-up to this match. One big absence is that of Omonoia attacker Demetris Christofi. A recent injury in a league match means that the 29-year-old will misses out on this qualifier. APOEL’s George Efraim is unavailable while Konstantinos Mintikkis was left out of the squad, due to injury as well. Mintikkis was replaced by Marios Stylianou, a likely back-up to first-choice right-back Jason Demetriou. Greek manager Michael Skibbe will be ecstatic to have seen Kostas Mitroglou training with the rest of the squad this week. The Marseille striker suffered a preseason knock that saw him miss Greece’s previous two qualifiers. However, there was bad news on Thursday as it was confirmed that Tasos Donis will miss Greece’s remaining two qualifiers due to injury. That will be a big blow to Greece as Donis has been amongst the team’s top performers in recent matches. Dimitris Diamantakos was injured after the squad announcement and his place was taken by Nottingham Forest striker Apostolos Vellios.